The knee is a complicated joint. Not only is it fully articulated, with a wide range of motion, it's also capped a with a flat bone—the patella or kneecap—that provides additional support and stability. However, damage to the kneecap can lead to a condition in which it's subject to repeated dislocation. When this happens the best solution is surgery to stabilise the kneecap and prevent future dislocations. How does the Kneecap become Dislocated? The knee is a joint that looks and functions just like a hinge. The ends of the femur (thigh bone) and tibia (shin bone) come together at the knee, where they are articulated with ligaments, muscles, and cartilage. The kneecap is a flat bone that attaches to the femur, and covers the front of the knee joint. The kneecap protects the front of the joint, and also helps to make it stronger and more stable. Dislocation of the kneecap happens when the kneecap slides out of place, causing severe pain and swelling. This can happen due to a direct impact that knocks the kneecap from its normal position, or a sharp twisting motion of the knee or ankle, where the impact of the motion forces the kneecap out of place. Some people have a high risk of suffering from repeated dislocation of the kneecap; for instance, it's a relatively common injury in sports that involve movements where the knee is rotated. Sometimes the kneecap can be manipulated back into place without the need for further treatment. However, after each dislocation the risk of it happening again increases. People who suffer from repeated dislocations of the kneecap have a high risk of additional problems such as osteoarthritis of the affected joint. Repeated dislocation of the kneecap makes it increasingly likely that further dislocations will occur. This is because with each successive dislocation, the tissues that hold the kneecap in place become weaker. As a result, kneecap dislocation needs to be treated with care to minimise the risk of future problems. Conservative treatment of kneecap dislocation includes rehabilitation of the knee joint, plus physical therapy to strengthen it and reduce the risk of further dislocation and other problems such as osteoarthritis. However, if dislocation continues to be a problem then surgery may be the only solution. Surgery to stabilise the kneecap typically focuses on an interior ligament that holds the kneecap in place over the knee joint. This ligament—called the medial patellofemoral ligament—weakens progressively with each dislocation, so strengthening it reduces the possibility of further dislocations. An alternative option is a so-called “bony” operation in which the attachment point for the kneecap tendon is moved to a new position on the tibia. This relocation provides extra stability for the kneecap and helps prevent dislocation. After surgery, recovery and rehabilitation largely depends on the kind of surgery a patient has. 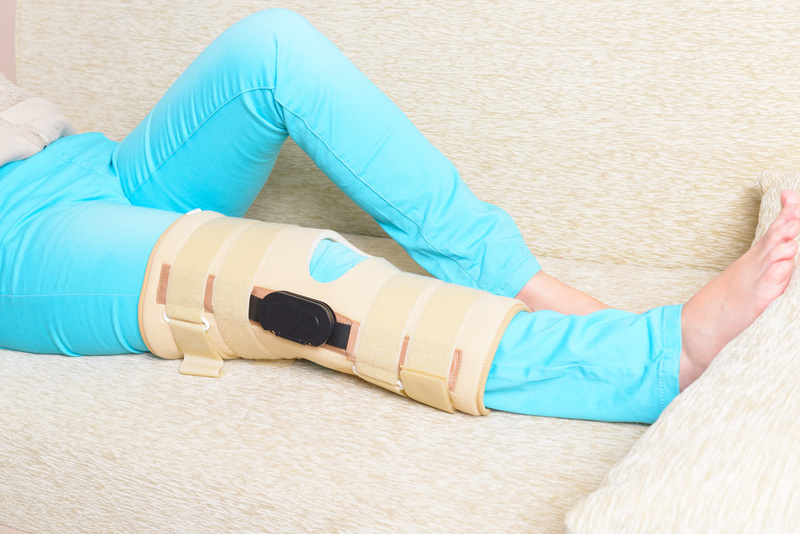 Both kinds of surgery require a period of recovery in which the leg is protected from bearing any weight, and the patient may also wear a splint or brace to provide support for the kneecap. In general, the healing process is faster after ligament surgery than after surgery that involves the tibia bone. Everyone is different when it comes to healing. Some people heal more quickly than others, so when it comes to healing after surgery, the focus is on healing at your own pace. Generally, most people can walk with the use of crutches or a similar mobility aid the day after surgery, and can try a no-impact form of exercise such as swimming or stationary bike riding after 2 to 4 weeks.